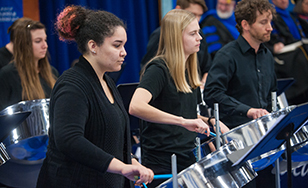 St. Scholastica's percussion ensembles and a few friends will host a spring concert at 3 p.m. Saturday, April 21 in the Mitchell Auditorium on campus. The concert, "So Happy Together," celebrates collaborative music-making and community. It will feature St. Scholastica's three distinctive percussion ensembles: the drum line, steel band, and world drumming ensemble. "It should be a festive afternoon with a lot of energetic and enthusiastic music making," said music department chair and percussion ensemble director Dr. Jeremy Craycraft. The percussion groups are collaborating with Nancy MacGibbon and students from Two Harbors High School on a West African piece by St. Paul composer Sowah Mensah, along with Nicholas DeShaw, a local artist who specializes in the Brazilian martial arts/dance form capoeira. They will also be joined by students from the percussion program at Inver Hills Community College under the direction of Andrew Martin. "His ensembles will play and we will join forces for a mass steel band on two tunes," Craycraft said. Tickets are $5 and will be available at the door before the concert. For details, contact the Spotlight Box Office at spotlight@css.edu or 218-723-7000.